The Mitch Thomas Show debuted on August 13, 1955. It was one of the first televised dance shows for black teenagers. During its three-year run, Mitch Thomas brought black rock and roll stars to television, including Little Richard, the Moonglows, Frankie Lymon and the Teenagers, and Ray Charles. In a typical dissemination process [read: cultural appropriation], dances seen on Bandstand were often picked up at school dances or local dance hops and brought back to the show where they were presented by mostly white adolescents. In fact, many dances derived from The Mitch Thomas Show, the popular all-black teen show in Philadelphia, from which they were copied by white teens and then seen on Bandstand. In the context of local and national mobilization in favor of segregation, underscored by widespread anti-black racism, integrating American Bandstand would have been a bold move and a powerful symbol. Broadcasting daily evidence of Philadelphia’s vibrant interracial teenage culture would have offered viewers images of black and white teens interacting as peers at a time when such images were extremely rare. Clark and American Bandstand, however, did not memory of integration. Rather than being a fully integrated program that welcomed black youth, American Bandstand continued to discriminate against black teens throughout the show’s Philadelphia years. Located in Center City at Broad and Race, the Scottish Rite Temple, also known as Town Hall, was built in 1926. 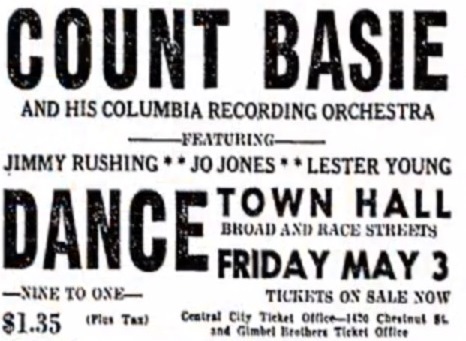 The 1,692 seat auditorium played host to jazz and blues greats, including Count Basie, Lester Young and Jimmy Rushing. 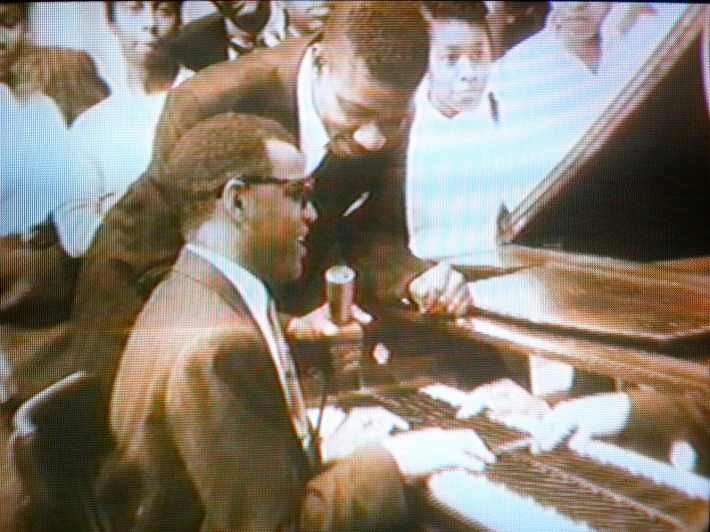 On Nov. 17, 1955, Ray Charles and his entire band were arrested on drug charges. Town Hall was divided into two sections; the theater and the cabaret. The Ray Charles show was scheduled for the cabaret. Excited about appearing with a major star like Charles, the Sensations settled into their dressing room and began preparing for the show. All of the sudden, the dressing room door burst open and Ray Charles entered with his entourage including band members David “Fathead” Newman, Jay Dennis, James Sheffield, William Peoples, John Willis, Joseph Bridgewater, Tommy Brown and vocalist Mary Ann Fisher. The Ray Charles band informed the Sensations that this was to be their dressing room and the Sensations must leave. While somewhat in awe of Ray Charles, the Sensations would not back down and give up their dressing room. They were Kae Williams’ group and Kae was producing and MC’ing the show. If Kae wanted them to have the dressing room, they were staying put! In the middle of the ensuing argument, Kae Williams walked in. The argument continued for a short while with much shouting. Ray Charles and his band succeeded in getting Kae and his group out of the dressing room and locked the door. Alphonso and the group watched as Kae Williams went to the hallway pay phone and made a call. Shortly thereafter, another commotion ensued. A team of Philadelphia police officers were banging on the door to Ray Charles’ dressing room, looking for drugs. People in the entertainment field knew that members of Ray Charles’ group had at times indulged in the use of illegal substances. But then, drug use was rampant in the business. According to the Philadelphia Tribune, the police found a burnt spoon, a needle and syringe, and a small quantity of marijuana in the dressing room. In addition, Charles and three of the band members were reported to have fresh needle marks in their arms. Ray and his band members were promptly placed under arrest. Fearing a riot, the police consented to allow the show to go on. But through the entire show, the stage was encircled with cops. The landmark was demolished in 1983 and replaced with Parkway Corporation’s headquarters and parking garage.